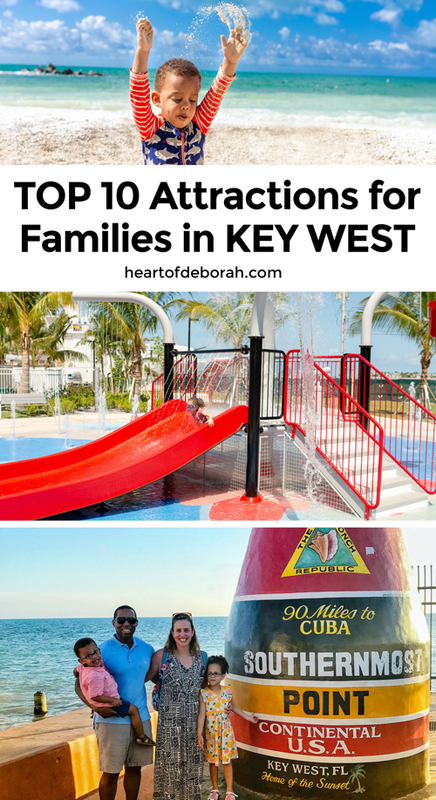 The 10 BEST Things to Do in Key West With Kids, Hidden Gems Included! 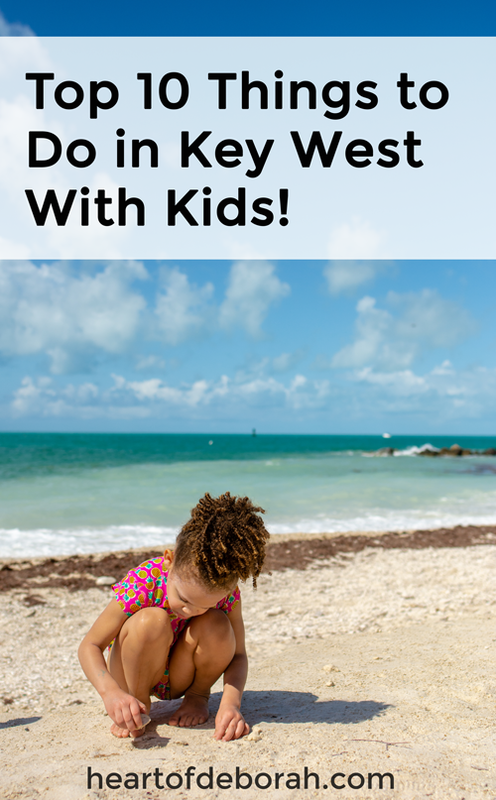 The 10 BEST Things to Do in Key West With Kids! 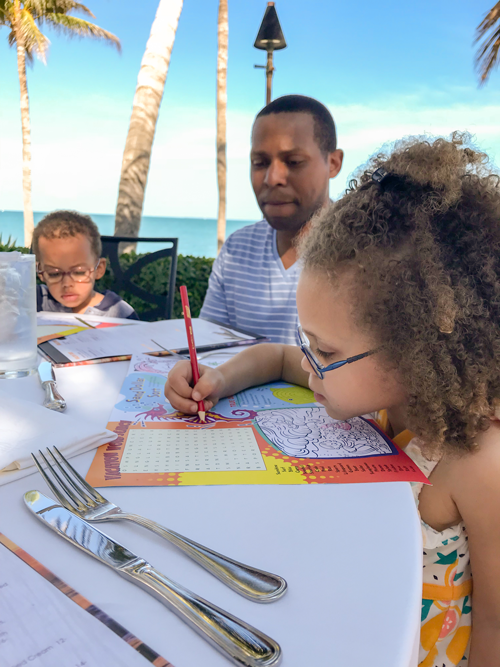 We recently got back from a family trip to Key West, Florida and it was a much needed oasis. I knew before we headed to Key West with kids we needed to be prepared. The last time we took our kids on a trip, my son ended up getting the flu 4 days before we left and his 18 month old squirmy body did not love sitting on our laps for a 3.5 hour plane ride. Before we left I made a packing list and checked it multiple times. Thankfully this time around I actually packed the right stuff! 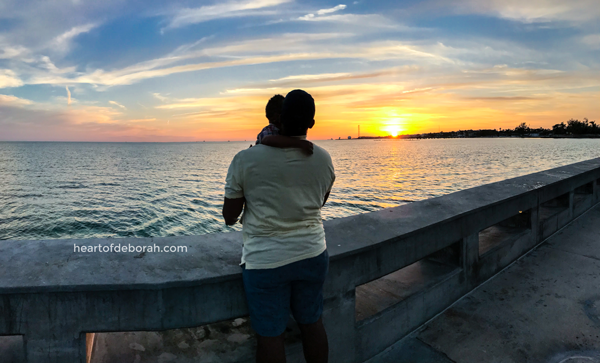 I’ve shared before how to travel with kids like a boss, but today I want to share with you 10 specific and enjoyable things to do in Key West with Kids. 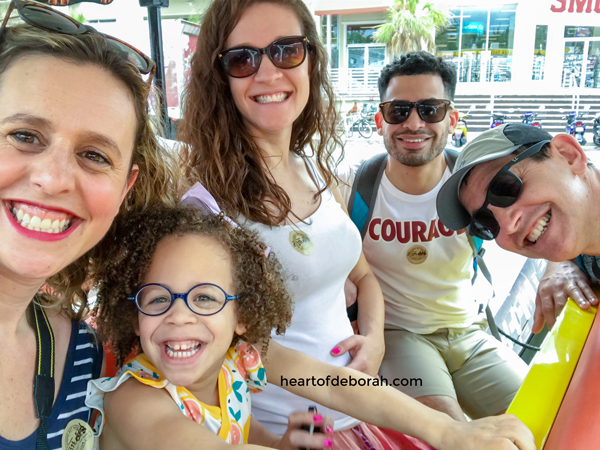 Be sure to follow Heart of Deborah on Instagram to keep up with our latest adventures! First, take a ride on the Conch Tour Train. We did this on our first day and it was the perfect way to get acclimated with the island. As adults, you will enjoy hearing the history of the town and taking in all the sites. Our kids thought it was awesome because it was a “ride” and the open air train was the perfect speed for them. Second, I highly recommend renting bikes. The island is small enough to easily navigate without a car. The kids thought it was awesome that our car for the week was a bicycle. We rented bike trailers for them to ride in while we navigated the island. At first I was a little worried about driving in the street with kids in the back, but once we got going I felt very safe. There are bike lanes on some streets and generally cars go slow (most of the time). 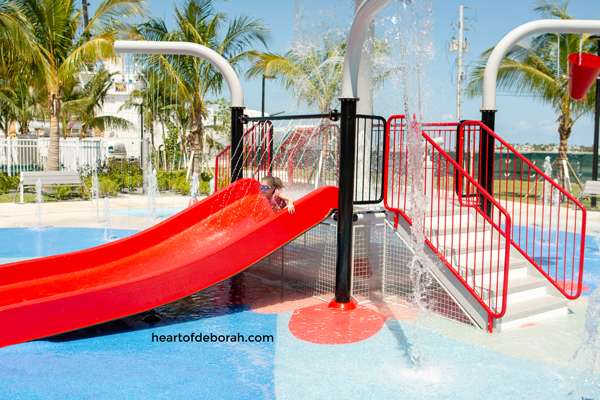 Third, you must take a morning or afternoon trip to the new splash pad near Fort Zachary Taylor State Park and the waterfront amphitheater. Our daughter must have went down the slide 50 times. And she would have kept going, but it was time to leave! It was so clean and fresh. There were even spots of shade with plenty of benches for parents to take a break on while still keeping on eye on the kids. Definitely one of most family friendly spots in Key West. Fourth, eat breakfast at latitudes one morning. Latitudes is a restaurant on it’s own private island. You take a 5 minute boat ride to the Sunset Key Cottages resort. The boat ride alone was a highlight for our kids. The breakfast is amazing and a lot cheaper than lunch or dinner. The views are even more spectacular and the staff was very accommodating to our two small children. Waiting for breakfast at Latitudes. Beautiful view of the ocean from our table! Fifth, take a bike ride to the beach at Fort Zachary Taylor State Park. You have to pay a small fee to get in, but the beach was very clean and safe. Though be warned, almost all the beaches in Key West are filled with small pebbles and rocks. 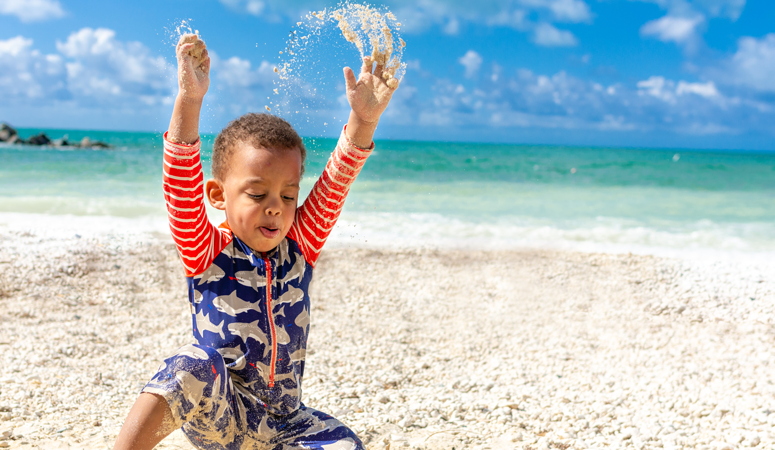 There wasn’t a big place to build a sandcastle, but our kids still had a blast playing on the beach and looking for small seashells. Sixth, head to Higgs beach. We spent a second morning at the beach and we decided to try Higgs beach. Again, the sand was a little rough, but there are public bathrooms and the water was great. You could swim out very far without it getting too deep. It is also close to the West Martello Tower (#10) and the pier (#7). Seventh, take bread to the White Street Pier (near Higgs beach) and feed the fish. One night after dinner we went to watch the sunset off the pier. We also brought some leftover crackers and bread. The kids had a blast feeding the fish and we saw quite a few! A sand shark, parrot fish, lobsters, etc. It’s an easy and free way to spend an evening. It wasn’t that crowded and the sunset was phenomenal. You can also fish off the pier. Eighth, take a picture at the Southernmost Point after you eat dinner or breakfast at the Banana Cafe. We ate dinner at the Banana Cafe and it was delicious. The organic burger was savory! It was also very family friendly. Then we took a stroll down to the Southernmost Point. FYI at times there are lines to get your picture taken, but this could be an essential photo when you visit the Florida Keys with kids. Ninth, visit the playground behind Saint Mary Star of the Sea. This playground was right near the house we rented for the week and the kids had a blast playing here in the afternoon. If you visit Key West during the school year, you’ll have to visit the park after school hours. It has a large canopy overhead for shade and it was a very peaceful area. Lastly, visit the gardens at West Martello Tower. Unfortunately we ran out of time and didn’t make it to these gardens. But we rode our bikes past it a few times and it looked beautiful. The kids may not want to spend all morning here, but it has great spots for photo opportunities. So that is it! 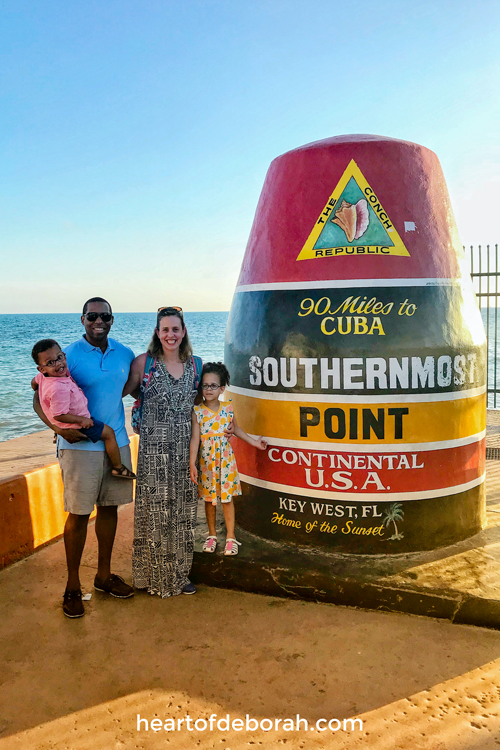 Our favorite things to do in Key West with kids. There are quite a few things not on our list that you may still enjoy. 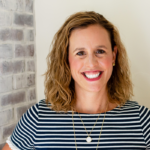 Do some research before your trip to figure out what works best for your family! We did go to the aquarium near Mallory Square, but to be honest it wasn’t anything special. We skipped the butterfly exhibit because we’ve been to some before. Have you been to Key West? 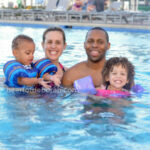 What are your favorite things to do with kids when traveling? 5 Brilliant Ways to Teach Kids about Diversity!